Bean Around Town: Success! Homemade Yogurt. Now, that always sounded complicated to me, but it turns out, it is not at all. Funny thing is, I decided to try it with powdered milk. Not because I particularly use it all the time, it's just that I had mixed up a litre of it to use for coffee and oatmeal before we did our shopping. My husband will hardly go near powdered milk, maybe a dribble in his coffee if there is nothing else. I find if you mix it properly and chill it over night, it's nearly like skim, which is fine for me, in a smoothie, or for baking. My four year old son hasn't noticed yet. Anyway, I had this litre of milk hanging around, and a tiny bit of plain yogurt left, I thought why not? I gave it a whirl. I don't have a yogurt maker or even a thermometer. I might invest in a thermometer because I do feel like I was pretty lucky in my temperature guessing. I was using the reconstituted milk so it wasn't a huge investment if I screwed it up. Next time though I will use full fat milk and a thermometer to do it properly. I thought of this exercise as comparable to using a muslin instead of the expensive fabric when sewing. It was a trial run. 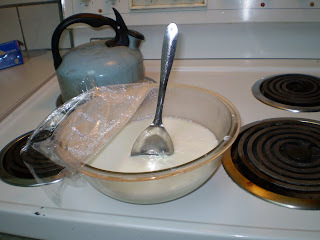 I gathered my ingredients; milk, one litre, and plain yogurt, for starter, 1/4 cup, maybe a scraping more because I wanted to use it up. That's it! I like a two ingredient recipe. I made sure my yogurt had active bacterial cultures listed in the ingredients. It did, I was good to go. First I brought the milk just to a boil, while stirring often. I did this on a medium heat, which takes a tad longer but lessens the risk of scorching the bottom of the milk. Once it came just to a boil, I took it off the heat and let it cool. The directions said to cool until 120 degrees, or until the "bite" of hotness is no longer felt when you put your finger in the milk. Well, I put mine in the freezer to cool faster because I am impatient like that :) Then I went on the computer and forgot about it, then when I took it out I was sure it was too cold, so I put it in the microwave. I don't recommend this round about way of doing things, I am just being honest about my ways. I have made a few errors in the kitchen experimenting, but hey, live and learn, I always say. 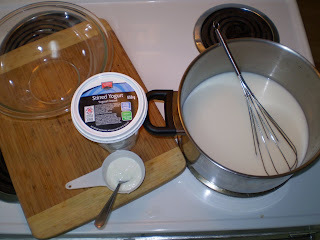 I put the spoon in to show that it is quite thick as is, though I have read in the reviews that some strain it in cheesecloth to extract more whey and have an even thicker yogurt. Considering this is made from reconstituted powdered skim milk, I am pretty satisfied with my yogurt making experience. Homemade, low fat, smoothie yogurt! I wonder why I am paying two or three dollars for the half the same amount, every week, in addition to the lunch yogurt we buy....Hmmmm. Something to think about.